SSC CHSL Application Form 2019 | The application form of SSC CHSL are out on 5th March 2019. The article below has detailed information regarding the SSC CHSL exam. The candidates can stare preparing to fill the form. They must have all the required documents for the SSC CHSL Application Form. Students can check SSC CHSL Official Recruitment Notification here! Check SSC CHSL Recruitment Notification PDF Here! NOTE: The official notice has been updated. 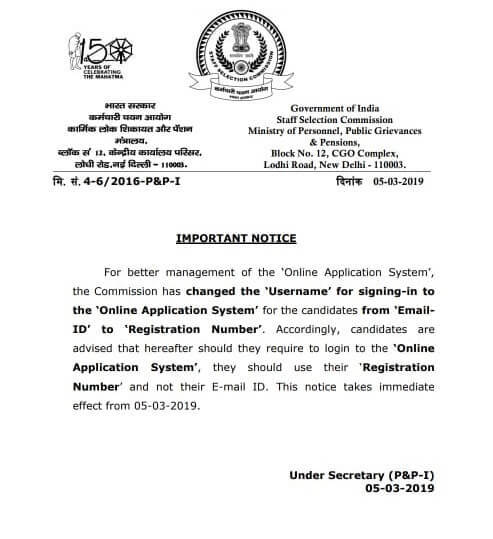 The SSC authorities have modified the 'Username' for signing in to the 'Online Application System' for the candidates from 'Email ID' to 'Registration Number' only in order to better working of Online Application System. So, whenever the candidates are logging in to the Online Application System, they must use their Registration number other than Email id. Ex-Servicemen 03 years after deduction of the military service rendered from the actual age as on the closing date. Candidate’s name The name should match the name in the class 10 certificate. Legal proof is needed in case of the name change. Father’s name The name should match the name on class 10 certificate. The name change must be assisted with legal proof. Mother’s name Same as registered in the class certificate or birth certificate. 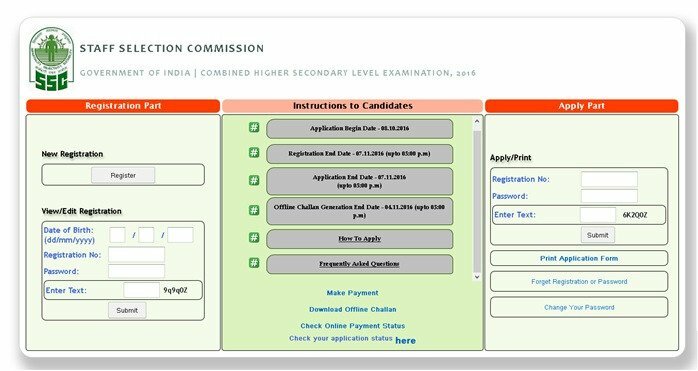 How To Fill SSC CHSL Application Form 2018-19? 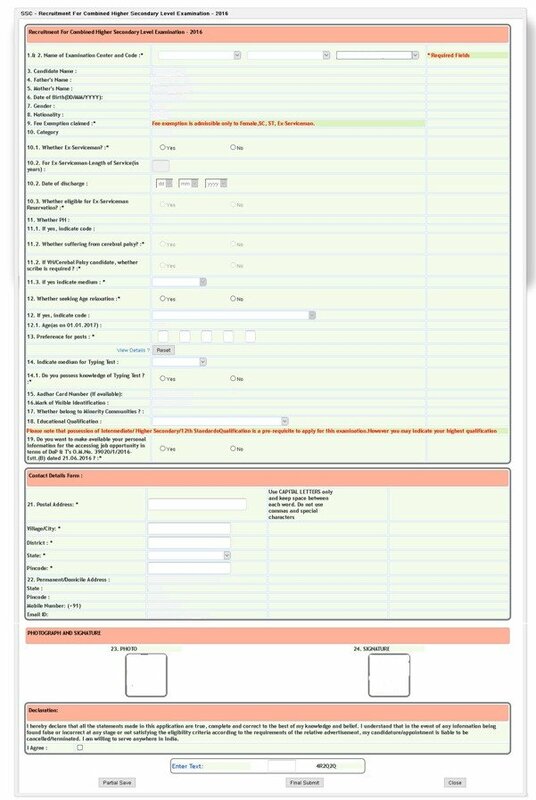 Then, the candidate needs to fill in the personal details like Name, Father's Name, Phone number, E-mail address etc. How to retrieve the registration id or password in SSC CHSL Application Form? All candidates must keep in mind that there is no option of SSC CHSL Form Correction. Once the candidate has filled in the details and submitted it, they cannot make any modifications after that. Q. How can I check the SSC CHSL Application Form Status? Q. How can we check the payment status of bank challan? A. It takes 3 business days if one has paid the fee from bank challan. After 3 days, check the application form status, it will show the right information. Q. How can I download the application form? A. There is a print/apply button in the registration form. Click on it. The PDF is downloaded. Q. How can I edit my application form? A. Firstly, candidates can only edit the registration form two times. To edit the application form, candidates must visit the official website, click on 'View/Edit Application Form'. Q. I was making payment and the link got disconnected. What should I do? The Chhattisgarh Professional Examination Board (CG Vyapam) released an official Notification for recruitment of Secondary Level CG Teacher Exam Pattern Lecturer, Teacher, and other posts. Eligible candidates need to apply through the prescribed format latest by 25th April 2019. With the release of official Notification, CG Vyapam recruitment promises a total of 14,580 vacancies for Lecturer, Teacher and other posts. Chhattisgarh Professional Examination Board released an official notification for CG Vyapam Recruitment 2019. Applicants are advised to read the official Notification before starting the application for CG Vyapam. Application for the posts of Lecturer, Teacher and other posts will be subject to various Eligibility Criteria as mentioned in the official notification. Candidates need to possess certain Educational Qualification and should come under an Age Limit set by the officials. Applicants need to possess an Undergraduate/ Degree/ B.Ed/ TET/ equivalent from any recognised university/ institution. Read the notification correctly to check your eligibility for CGVyapam teacher jobs 2019. Eligible candidates fill all mandatory details of the online registration form and upload necessary documents. Chhattisgarh Professional Examination Board will release the result for Written examination a few weeks after the written exam date. We will update this page once the result for CG Vyapam will release on the official website. CWC Recruitment: Central Warehousing Corporation recruits aspiring candidates for a variety of posts in the organization namely Management Trainee, Superintendent (General), Junior Superintendent (General), Accountant, Translator etc. CWC Recruitment 2019 published the Official CWC Notification 2019 on February 13, 2019. CWC Application Form is available from February 15, 2019. The last date to apply for CWC Recruitment is March 16, 2019. For the posts of Superintendent (General) and Junior Superintendent, the minimum age limit is 30 years. The better post to look out for between Jr. Superintendent and Superintendent can be decided by checking the CWC Salary and Job Profile. A total of 571 Vacancies have been declared for CWC Recruitment 2019. The type of questions asked to qualify in the exams are sectioned as Reasoning and Computer Aptitude, English Language, Data Analysis & Interpretation and Quantitative Aptitude, General Awareness and Professional Knowledge. CWC Recruitment Selection Process for Superintendent (General) includes the following stages: Online Test & Document Verification followed by Interview. For Junior Superintendent, CWC Recruitment Selection Process has two stages namely online Test followed by Document Verification. The official notification was published on February 13, 2019.Important dates, details about the post, eligibility criteria, examination structure and other important details can be found through the official notification from the official website of CWC. Central Warehousing Corporation under the administrative control of Ministry of Consumer Affairs, Food & Public Distribution provides Scientific storage facilities for agricultural inputs, produce and other notified commodities besides providing logistics infrastructure like CFSs/ICDs, Land Custom Stations, Air Cargo Complexes etc. for import-export cargo. Online application from eligible candidates, who fulfil the prescribed qualification, experience, age, etc., are being invited for 9 posts. The best considered post is of Management Trainee (General and Technical). The total vacancies are 571. The highest number of vacancies are for the post of Junior Technical Assistant with the number of vacancies being 238. 10% of Vacancies are reserved for the economically weaker sections as per the directions of Government of India instructions. Minimum age to apply for all the posts is 18 Years. Reservation, age relaxation and other concessions to reserved category candidates, or for any other category, would be applicable as per Govt. of India orders; wherever posts are reserved under these categories. CWC Eligibility Criteria is the deciding factor for any candidate’s selection to any post in Central Warehousing Corporation.CWC Eligibility includes age limit restrictions and required educational qualification. CWC Online Application Link is now active and will remain active until March 16, 2019. Candidates have to apply online for the exam.Candidates must keep a scanned copy of their photograph, signature, left thumb impression and a hand-written declaration. If you are a new user, you must register first. If you have already registered, you must login using the registration number and password to continue the application process. Click on “New Registration” and enter your name, contact details and email to register as a new user. Note down the registration number and password. Furthermore, fill the personal and academic details asked in the application form. Make sure all the information entered is correct, authentic and as per your class 10th certificate. Validate the details entered and move to the next step. Upload your photograph, signature, thumb impression. Preview the form before final submission of the information. The last step is to pay the application fee through online mode only. After the payment is updated, submit the completed form. It will be available for download on the official website of the Central Warehousing Corporation. The examination will be conducted online in venues across centers in India. The tentative list of Examination centers is available. CWC Result 2019 will be declared separately for different postcodes. CWC Result 2019 will be displayed on the official website of the Central Warehousing Corporation. Candidates can check their result on the official website as soon as the result is officially announced. Candidates who qualify the exam will go for document verification followed by the interview/Skill test. After CWC exam Result the process of document verification and interviews (if applicable) is scheduled at Central Warehousing Corporation Office. Call letter for the same will be made available online. Each candidate will be required to obtain a minimum total score to be considered to be shortlisted for Interview/document verification/skill test. Prior to the completion of the Interview/document verification/skill test process, scores obtained in the online examination will not be shared with the candidates shortlisted for such process. However, the scores of unsuccessful candidates will be shared at the time of declaration of result of online test. Previous year cut off marks. CWC Exam will be conducted in different formats for different posts. Check and verify the godown-wise and commodity-wise accounts and append his signatures in token of having done so. Assist in ensuring proper godown hygiene as also to assist in building up of proper stacks. Act as in charge for stocks, operations and godown(s) as may be assigned by the Warehouse Manager. Ensure timely submission of returns and reports to Head Office/Regional Office and to handle general correspondence. Deal with all matters connected with H&T operations e.g. checking/countersigning of work-slips and scrutiny of contractor’s bills. 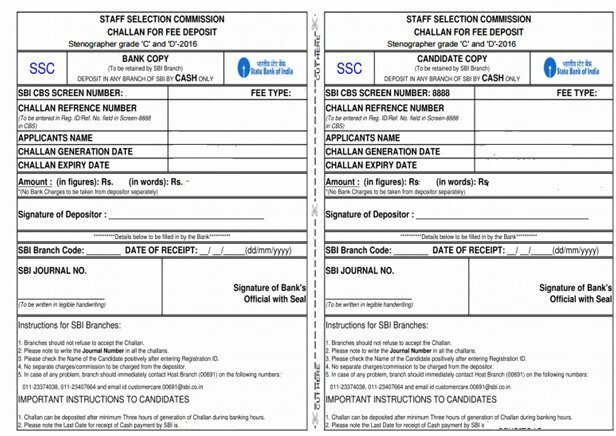 Check SSC CHSL Application Form filling procedure here! Candidate must have passed Class 12 or equivalent examination from a recognized Board or University. For Data Entry Operator in the Office of Comptroller and Auditor General of India (C&AG): 12th Standard pass in Science stream with Mathematics as a subject from a recognized Board or equivalent. 09 Ex-Servicemen 03 years after deduction of the military service rendered from the actual age as on the closing date. Then, the candidate needs to fill in the personal details like Name, Father’s Name, Phone number, E-mail address etc. Note: The candidates must remember that there is not an option of modifying the application form. They must fill the details correctly and carefully otherwise they will find themselves in a trouble. SSC CGL Notification is released already. So many candidates are looking for the best SSC CGL Preparation – study plan. The preparation plan makes things very easy to be in flow. The following article will guide the candidates to SSC CGL study plan for 10 days. They can start studying right now! Everyone wants to crack the exam in first attempt. So, we have made a perfect 10 days plan for the candidates who are very serious about studying and achieving their dream of clearing all the Tiers. If any candidate follow the given schedule religiously, there is a guarantee of 100% results. It can be difficult in the middle of the journey. But DON’T GIVE UP! RPF Result 2018 for SI and Constable (Group E & F) Released | Check Merit List! Railway Protection Force declared RPF Result for Group E Constable and Group F Constable & SI 2018. Aspirants can quickly check their RPF Constable Result & RPF SI Result 2018 online. You need to score above the expected cut off marks in order to get shortlisted for the next stage of the selection process. Aspirants, who are qualifying in the Online Exam will get consent to attend the Physical efficiency test. We have updated the direct link to check your result as it is out on the official website. Railway Protection Force will publish RPF Result 2018 on the official website of the Railway Protection Force. If you have attended the Exam, you can check the RPF Result. Click on that notification and read all instructions. Enter the Hall Ticket Number and Date of Birth details. The Railway Protection Force Result will display on the screen. Save/ Print the RPF Result for future use. Make sure that you provide all the necessary details like registration number, date of birth to check your result. The scorecard will show how much marks is secured by the candidate in the exam. Railway Protection Force will release the RPF SI and Constable exam marks and scorecard after a few days of result declaration. You can check the scorecard on the official website and know your marks in various sections. Official Merit list is out along with RPF SI & Constable result for group E & F. The cut off will be released for RPF Constable and SI after the announcement of result. The cut off marks will be used to prepare RPF merit list. Separate merit list for Constable and SI will be prepared. The merit list will be used to shortlist candidates for the next stage which is Physical efficiency test. Congratulations to the selected candidates. Keep visiting our blog posts for more recruitment and exams related post.